The Jikei Group of Colleges’ Jikei Space Inc. completed remodeling work for Ryugu no Tsukai Spa & Resort, an Asian resort-style hotel in the Town of Higashi Izu in Shizuoka Prefecture and reopened the facility to the public on August 3. Jikei Group Chairperson Kunihiko Ukifune, together with Higashi Izu Mayor Chohachi Ota and other guests from the community, took part in the completion ceremony held on July 25. Ryugu no Tsukai Spa & Resort is a new type of hotel that hasn’t been seen before in an area such as the Inatori Onsen region, which is already saturated with Japanese-style inns. The newly renovated hotel is a 5-story, landscape-oriented building, decorated in a dark brown evocative of Asia, and set against a yellow and gray two-tone color scheme. The view from the hotel stretches out across the Pacific Ocean, with the Izu Islands far off in the distance. Ryugu no Tsukai Spa & Resort is the Jikei Group’s first real foray into hotel management. Jikei Space Inc. took over KKR Inatori, a corporate retreat owned by the Federation of National Public Service Personnel Mutual Aid Associations, and undertook a complete renovation of the building, replacing air conditioning units and kitchen equipment, and engaging a local construction company to make the structure more earthquake resistant. Pleasure Corporation, a group-affiliated company, will be responsible for managing the hotel. Higashi Izu Mayor Chohachi Ota and Chairperson Kunihiko Ukifune Attend Completion Ceremony. Jikei Group Chairperson Kunihiko Ukifune, Jikei Space Inc. Managing Director Kana Ukifune, Pleasure Corporation President Sakae Sekiguchi, Jikei Inc. President Toyonori Tanaka along with local construction company representatives including Arakawa Construction Llc. President Yoichi Arakawa attended the completion ceremony, which was held in the playroom across from the second floor front desk. Also taking part in the ceremony were representatives from the local community, including Higashi Izu Mayor Chohachi Ota. The hotel has a total of thirty-three general guest rooms. The rooms face the sea, giving all guests an ocean view. The hotel also offers twenty-six capsule rooms for students or backpackers on the first floor and can accommodate up to 120 people. Duce Design Room from Jikei Space Inc. handled the planning and design for the renovations. 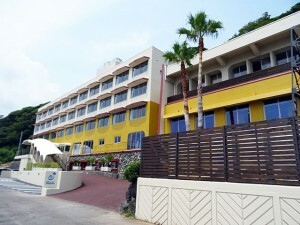 According to Duce Design Room and Pleasure Corporation President Sakae Sekiguchi, the keywords they envisioned for the resort hotel were “personal experiences,” such as scuba diving, “rejuvenating experiences” such as visiting a hot spring, a spa, or have a good meal, and “relaxing and unwinding.” “Ryugu no Tsukai” (giant oarfish) was chosen as the hotel’s name, which is literally translated as “Messenger from the Palace of the Dragon King.” In the well-known Japanese folk story “Urashima Taro,” the protagonist rescues a sea turtle, who brings him to the Palace of the Dragon King beneath the sea. The unique name of Ryugu no Tsukai therefore is one that evokes the image of the sea turtles living in the ocean right next to the hotel. Hot spring waters gush forth at eighty-four degrees Celsius from the source located below the hotel, feeding into large and medium-sized hot spring baths on the third floor, two private rental hot spring baths on the third floor, and another two on the first floor. A steam bath is also available. The hotel also has a spa, a soothing delight for any hot spring enthusiast. Ryugu no Tsukai Spa & Resort opened its doors to the public on August 3. In the summer, guests can swimming in seawater pool and the children’s pool or gaze at the stars or the ocean view. The resort has something for everyone. The hotel also has friendly instructors, and the guests can try diving as well.